My work is a reflection on the construction of identity, personal memories, collective history and cultural heritage in the digital age - how they are created, perceived and restricted by the physical limitations of the body in time and space. I approach the question from an anthropological and sociological perspective, looking at the changes but also the similarities between physical and virtual world; translating the codes and behaviors from one world to the other; exploring how our humanity and emotions reflect on the virtual sphere and, on the other hand, what happen when the virtual world "gets physical". 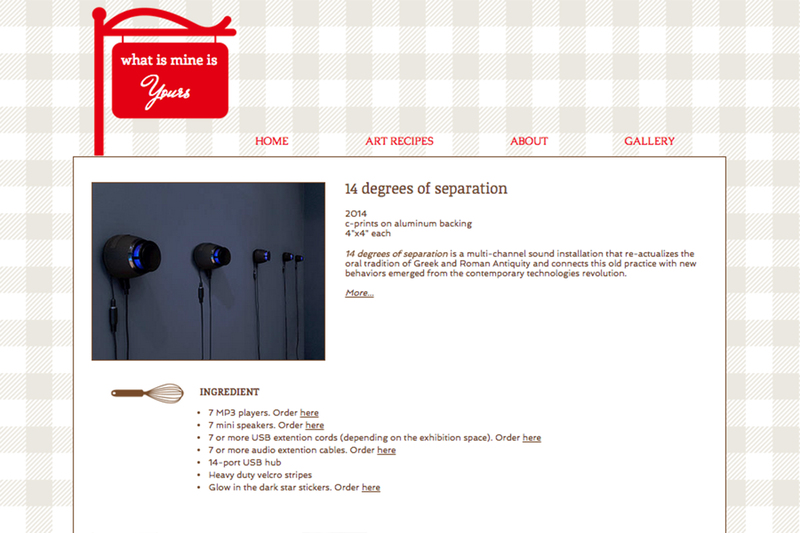 What is mine is yours is an on-going art project thatB re-evaluates authorship and ownership in the post-Internet age - celebrating the mixing culture that flourishes in the virtual word and expanding its reach to the material world. 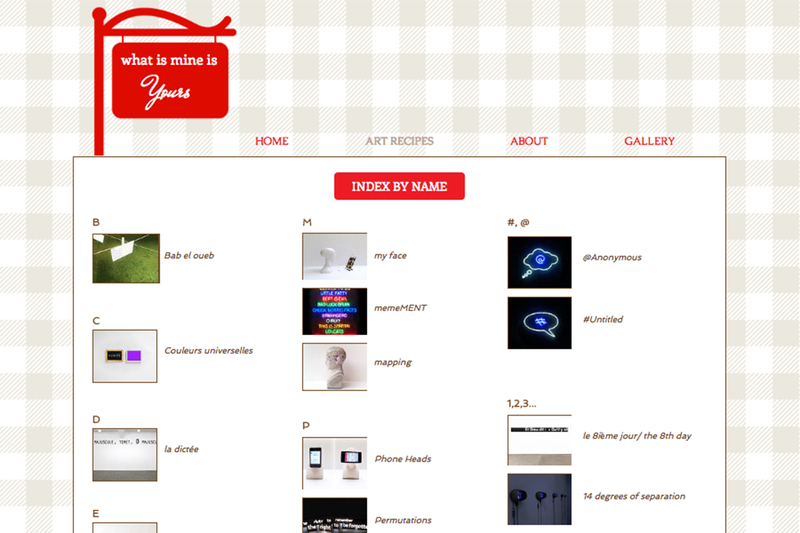 The project takes the form of a public website where artist, Esmeralda Kosmatopoulos lists all information required to reproduce any of her works created after January 2014. 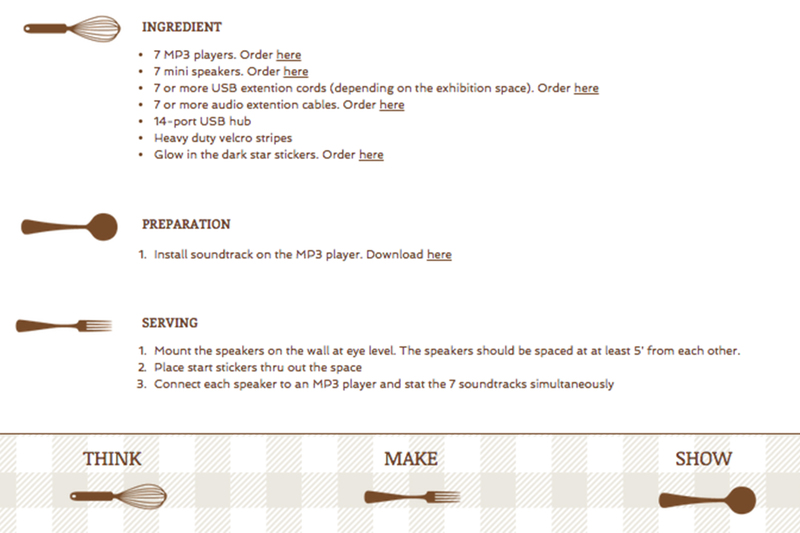 The website use the format, language and imagery of culinary sites, providing for each art project a recipe including a list of ingredients, a step-by step preparation tutorial and her suggestions on the final presentation of artwork. Renders, high-resolution images, links to suggested suppliers; all technical elements are made available for viewers to reproduce works identically and infinitely. The websiteB celebrates the concepts of remix culture, plural authorship and mimetic communityB associated with the rise of the Internet and new technologies. The project is anB open invitation for everyone to appropriate, reproduce, remix, redistribute, and reconsider some or all components of the artworks featured, generating new meanings and a continual global conversation. By virtually opening her studio practice to the world in complete transparency, the artist allows the meanings and concepts inherent in her works to be liberated from the label of singular authorship. 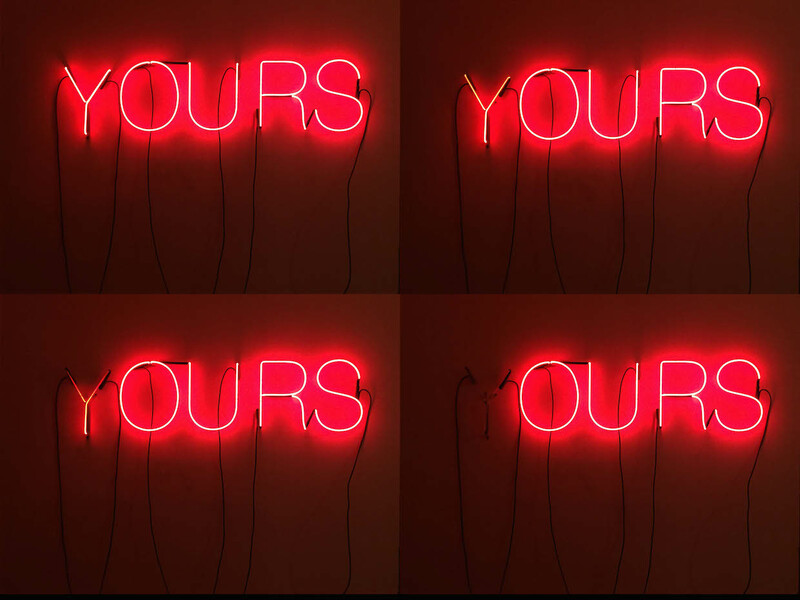 What is mine is yours follows the philosophical ideas of Roland Barthes and Michel Foucault, calling for a shift in authorship agency and moving away from the auteur online and offline. The projectB expands the concept of remix culture beyond the realm of Internet into the material world,B putting forth the two perceptions of authorship, pre- and post-digital, in direct conflict. Even if the artworks featured on the site contain some digital dimension, their manifestation remains anchored in the physical world; a world still dominated by the romantic instantiation of authorship and the notion of the author as bcreative geniusb as inherited from the Enlightenment. The project is both a strong affirmation of the artist position on the general concept of authorship and a more introspective reflection on her own artistic practice where Kosmatopoulos investigates the locus of her artworks. The physical art-making process is laid bare and demystified; the artwork is dematerialize. Its authorship and ownership are detached from previous manifestations, leaving the viewer face to face with the concept in its organic form. whose? explores the fundamental concepts of ownership, authorship and privacy in the post-internet age where online remix-culture, privacy infringements and web piracy come to challenge their traditional definition. While the neon letters "O," "U" and "R" shine with a clear, bright red light, the letter bYb appears weak, endlessly vacillating bright andB dull, fighting to remain on. 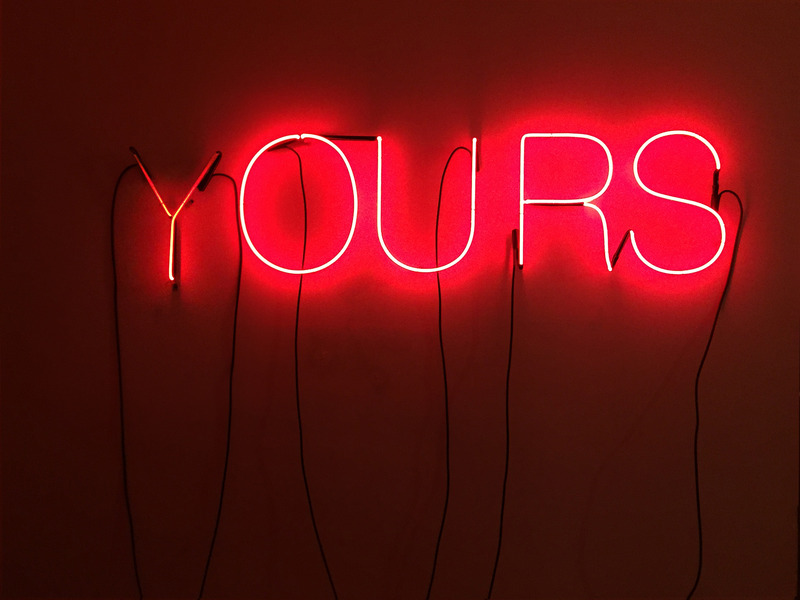 The playful flashing neon invites the viewer to reflect on the simple questions: What is mine? What is yours? What is ours? what is btheirsb? when online and offline.